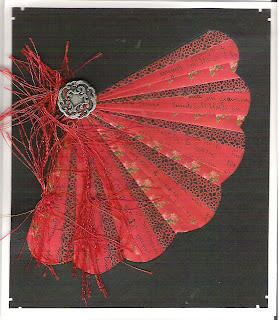 This is an iris folding fan made and placed on top of black cardstock. There is no cut out but just folded and cut papers. The fan does not lay flat but is creased and folded at each different colored paper. I added a silver emblem and yarn to the fan and used a punch on the corners of the cardstock. The pattern is from Design Originals Iris Folding book called Spiral Folding for Paper Arts by Suzanne McNeill. The book also includes 16 pages of folding papers of all colors.